The Secret is one of the simplest products on the market to prevent wrist breakdown while hitting balls. Developed in the 1970's by John Schlee, The Secret was reintroduced to the golfing world by Peter Albertson and subsequently endorsed by Greg Norman. The version you are viewing today is the Greg Norman endorsed edition which is a medium sized product that should fit most adults. The original Schlee men's model was about 20% bigger. The product is made from a durable ABS plastic with a neoprene backing for added comfort. 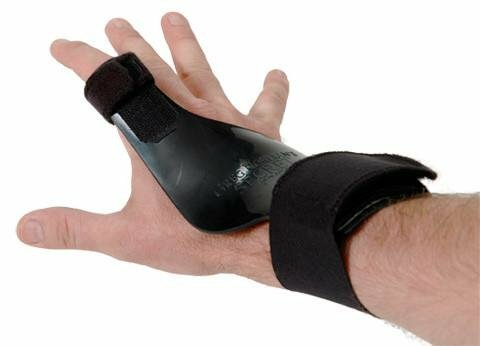 One of the appeals of The Secret is that it is very easy to put on and take off since you just stick your index finger in the finger strap and wrap the elastic wrist strap around your wrist once and press it down to secure. The angle is preset at about 40 degrees. Positions wrist at a 40 degree angle, which is ideal for chipping. Simple and easy to use, but highly effective in regards improving short game accuracy. Made from a durable ABS plastic with a neoprene backing for added comfort. Creates perfect position at address, top of swing, impact and follow-through. Suitable for ages 10 and up. For Right Handed Golfers. If you have any questions about this product by Birdie Town, contact us by completing and submitting the form below. If you are looking for a specif part number, please include it with your message.